We’ve hit several milestones in 2018. Just entering our third year, Blank Forms has expanded the scope of our operations, adding to our robust and ongoing performance schedule with four exhibitions, the publication of three records and two issues of our journal, and the initiation of major archival projects for a select group of historically important yet overlooked artists. Additionally, we’ve received thoughtful reviews and coverage of our programs in major publications such as The New Yorker, The New York Times, Artforum, The Wire, Pitchfork, and others. Blank Forms will maintain our momentum as we enter 2019: indeed, next year will see the release of not only two more issues of our journal, but multiple books of artist writings as well; we also have several archival and new audio releases lined up for the coming months. Our performance programming will continue to offer artists without prior institutional support the ability to realize their artistic visions in important venues and to receptive audiences. We’re incredibly grateful for the continuing, generous support from our members, partner institutions, and the engaged community of artists and audiences in New York City and beyond—and we’re honored to be able to present such important work for what we hope are years to come. There is a lot more to do. 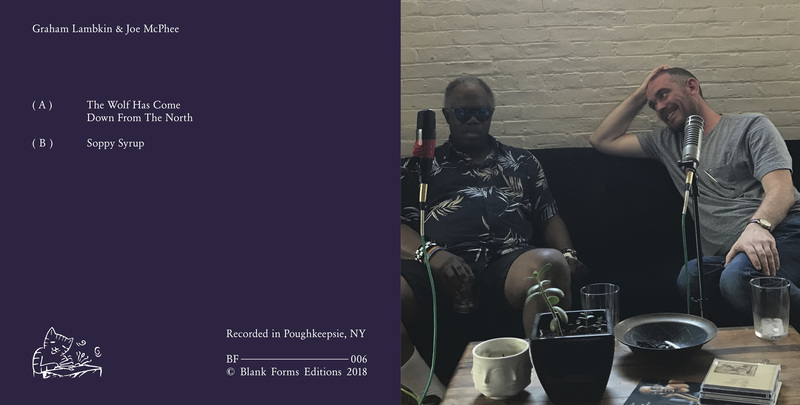 In celebration of another year, Blank Forms Editions is publishing a 7″ of new material by frequent Blank Forms collaborators Graham Lambkin & Joe McPhee. The record features two sidelong pieces—”The Wolf Has Come Down From The North” and “Soppy Syrup”—of absurd, delirious sound poetry, drawn primarily from the voices of Lambkin and McPhee, and marks their first vinyl release as a duo. The 7” is available as part of our end-of-year-campaign, as a handmade art edition of 25 copies, each featuring unique photographs of Lambkin and McPhee, and a regular edition of 275. -Patron membership, plus two complimentary tickets to all 2019 programs.